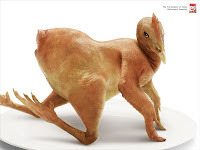 copyranter: Farm Animal Necrophilia Sells Meat Seasoning. 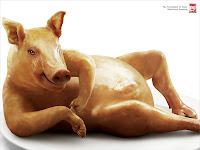 So, via Thailand, facsimiles of farm animal cadavers have been Playmate®-posed to sell meat seasoning. Nice art direction. Unappetizing idea. (we've seen that again and again and again in the food/digestion category.) Maybe it's a Thai thing, but—and I ain't no vegan—showing my future meals ogling me with dead eyes is not tempting. This smells strongly of an ad agency more concerned with industry awards than product sales. A previous Rachachuros seasoning campaign, showing the dead animals eating themselves, was slightly more palatable. Thailand? So shouldn't these models be dogs and rats and stuff instead of real food? Especially for the one posing, you know, doggy-style? Ha. My grossly overgeneralized cultural stereotypes serve me well once again. Dead eyes? If only! They're human eyes, which makes it even creepier. AIEEE! Yes they do have human eyes. What the hell. I don't understand your industry that well CR but this is way up there on the sick and creepy scale. Is that pig sporting wood? Thailand? That makes these ads even more wrong as these animals are surely underage as well. Oh my God! That pork IS sporting wood and two fat balls! Whoever did this is sick!